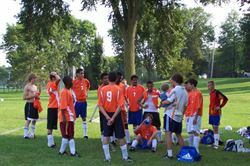 Home > Teachers > Last Name A-F > Adams (Old web site) > Relive the 2005 JV Boys Soccer Season! Relive the 2005 JV Boys Soccer Season! Assistant coach Ellen Adams tells the team if they win they can all go swinging at the park! Click below for game recaps! Check back often for updated stats and pictures coming soon! Be the first to tell me whats wrong with this picture at practice and receive a prize.